I have been crocheting less than usual this summer. It's a mixture between being too hot, working a ton at my day job, and having my mind preoccupied with our family's financial situation. It has felt a bit out of control for awhile and so I have begun to slow down to figure out why it got this way and how to fix it. The answer is to live WAY below your means - DUH! The trick is to figure out how to do it. For me, the freedom from money and the worries surrounding it has a three-pronged solution. First I begin with minimalism. I want less, I buy less, I drive less (and bike more! ), I have less and my life is much simpler, cleaner and more satisfying because of it. Two of the resources I used to learn more about minimalism are Marie Kondo and Miss Minimalist. But minimalism only gets you so far. You can be a minimalist and drop $5k on a capsule wardrobe from Madewell and sure enough money problems will still haunt you. The next step is frugality. When I need to buy something, I do my research and make sure I'm getting the best deal. I use coupons, shop sales, work Craigslist like nobody's beeswax, and I'm a thrift store queen. I have looked through all my expenses and slashed and burned as much as possible - I cut the TV cable bill (and use Netflix, Amazon Prime, and TV antennae instead), ditched the landline, I shopped for cheaper insurance for the cars and house, and I cut my grocery bill in half just by shopping the sales and coupons at Fred Meyer. I also now drive like a grandma so that my 2001 Civic now gets about 38 mpg. But frugality alone also has it's pitfalls. Think extreme couponers who have hoarded enough laundry soap to wash an entire army's fatigues. Or the person who buys 5 of the same shirt because it's on sale. 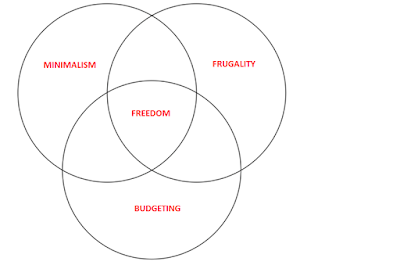 Without the other two prongs, "frugality" can leave you with less money and a bunch of stuff you don't need. For inspiration in the frugality department, check out the Non-Consumer Advocate and Mr. Money Mustache (this guy is hilarious and inspirational). The final step is proper budgeting. I have for years used Quicken and then Mint to budget. But those never actually changed my spending behavior. Month after month I'd get the alert "you're over budget in Coffee Shops category" or any of a number of other categories. There have been months where the only category I was not over budget was the Charity category. Yes, I am was THAT horrible person. What Mint and the like do is look to the past and tell you what a bad girl you've been but they don't give you any direction on how to fix it. I've now started using YNAB and am seeing some incredible results. YNAB lets you plan for the future. It says "let's figure out what your money needs to do for you until you get paid again." And when you go over in a budget category, you fix it by adjusting your budget with the dollars you have now. So when I go over in Coffee Shops, I pull some money from Restaurants or Groceries to fix it. No guilt, no regret, no hopelessness, you just move on. It's completely changed the way I think about finance. YNAB is going well and giving me the tools to be successful financially, but without the other two prongs (minimalism and frugality), it would would not do much good. If you are interested in trying it out, you can get a 34 day free trial. If you want to go right ahead and buy it, you can use this link for a $6 discount and I get a $6 bonus (totes win win). And that's all I have to say about that. 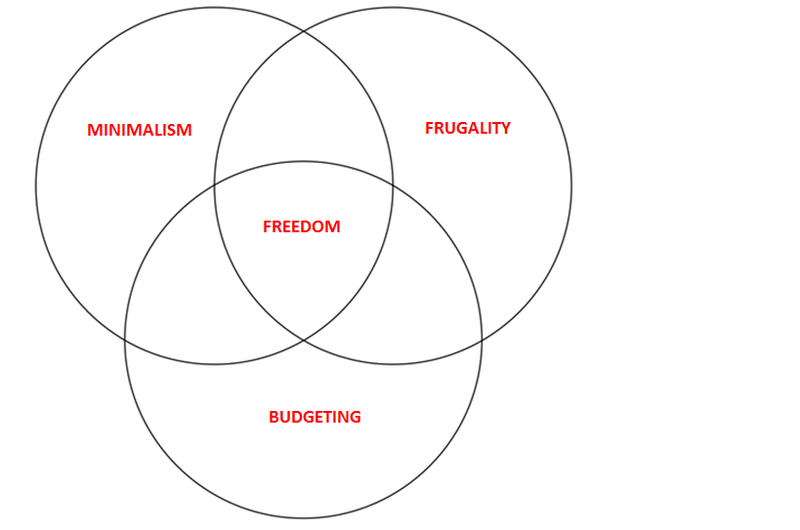 So here's my Venn diagram for financial freedom. I'd love to hear your thoughts. How do you keep you and your family financially fit?